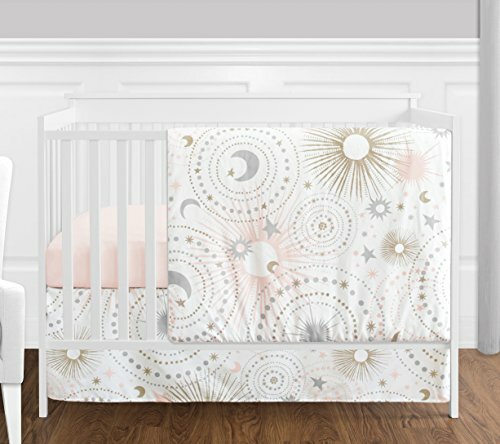 The 4pc Pink and Gold Celestial baby bedding collection by Sweet Jojo Designs will create a dreamy boutique setting for your little stargazer. This magical girl crib bedding set uses a sensational collection of exclusive brushed microfiber fabrics. It combines a stars and moons celestial themed print, a coordinating metallic gold star print, and solid blush pink and grey fabric. The beautiful color palette of blush pink, metallic gold, grey and white will set your nursery up in high style. This Sweet Jojo Designs set will fit all standard cribs and toddler beds and is machine washable for easy care and repeated use. Sweet Jojo Designs creates various coordinating room accessories for all of their children's bedding sets including wall decor, hampers, lampshades and window treatments. 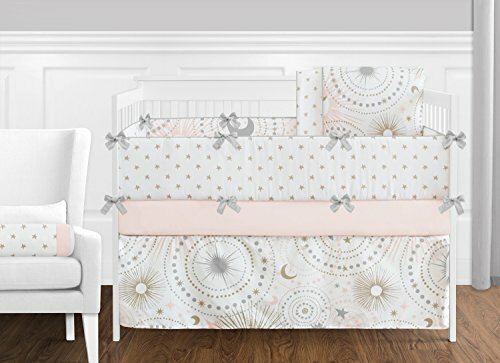 The 9pc Pink and Gold Celestial baby bedding collection by Sweet Jojo Designs will create a dreamy boutique setting for your little stargazer. This magical girl crib bedding set uses a sensational collection of exclusive brushed microfiber fabrics. 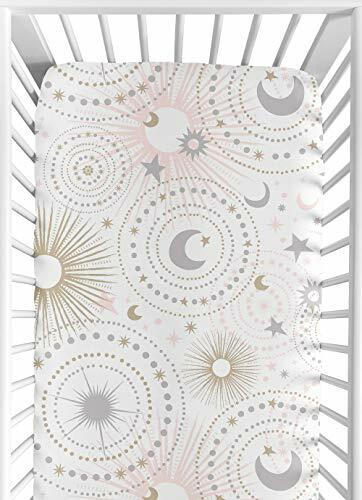 It combines a stars and moons celestial themed print, a coordinating metallic gold star print, and solid blush pink and grey fabric. The beautiful color palette of blush pink, metallic gold, grey and white will set your nursery up in high style. This Sweet Jojo Designs set will fit all standard cribs and toddler beds and is machine washable for easy care and repeated use. Sweet Jojo Designs creates various coordinating room accessories for all of their children's bedding sets including wall decor, hampers, lampshades and window treatments. 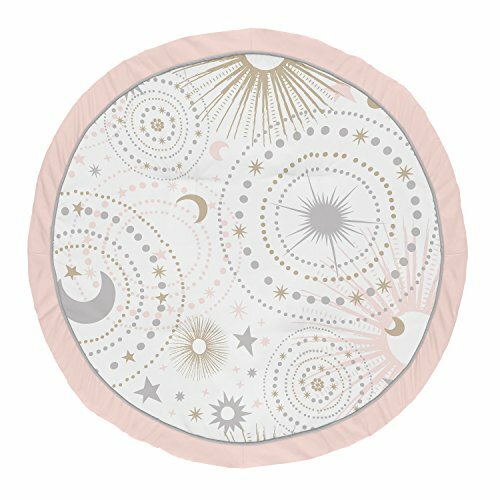 The 11pc Pink and Gold Celestial baby bedding collection by Sweet Jojo Designs will create a dreamy boutique setting for your little stargazer. This magical girl crib bedding set uses a sensational collection of exclusive brushed microfiber fabrics. 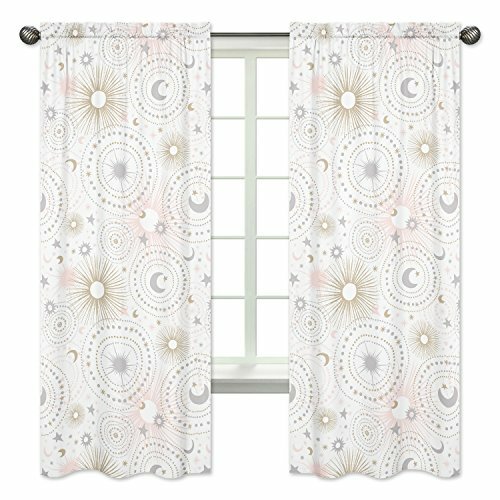 It combines a stars and moons celestial themed print, a coordinating metallic gold star print, and solid blush pink and grey fabric. 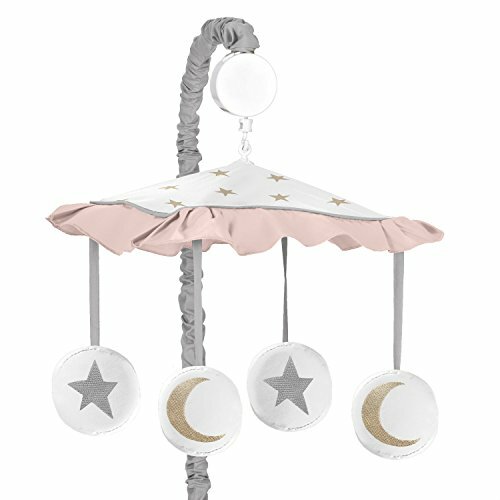 The beautiful color palette of blush pink, metallic gold, grey and white will set your nursery up in high style. This Sweet Jojo Designs set will fit all standard cribs and toddler beds and is machine washable for easy care and repeated use. Crib set includes: Crib Comforter, Fitted Sheet, Crib Skirt (Dust Ruffle), Diaper Stacker, Toy Bag, Decorative Pillow, Set of 3 Wall Hangings and 2 Window Valances. Sweet Jojo Designs creates various coordinating room accessories for all of their children's bedding sets including wall decor, hampers, lampshades and window treatments. 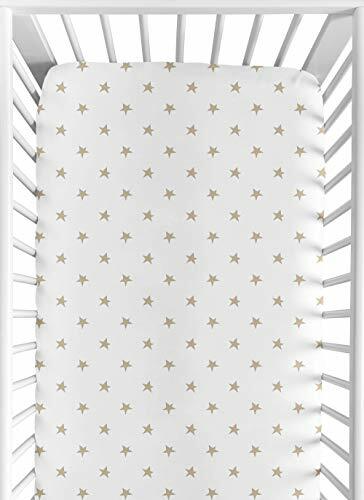 Changing Pad Covers are especially created to coordinate with their nursery bedding sets to complete the look and feel of the bedroom theme for your child. These changing pad covers fit all changing pads up to 17in. x 32in. Bring style and fashion into your home with these beautiful and unique decorative accent throw pillows. 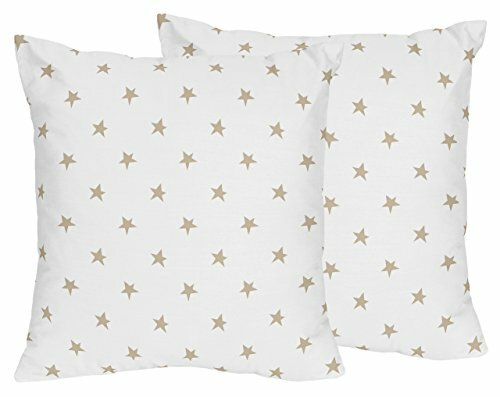 These metallic gold star print brushed microfiber pillows are both stylish and practical. No need to buy a new sofa or bedroom suite just because you're craving a change. Whether on a bed, chair, or sofa, these large throw pillows are a great and inexpensive way to get that instant makeover. Coordinates with matching bedding sets by Sweet Jojo Designs. Please Note: These pillows are sold as a set of 2 - order as many as you need. Make tummy time and child development stylish and fun with Play Mats by Sweet Jojo Designs. Made with soft fabrics and lofty fill for your baby’s comfort, this multi-functional mat comes in a variety of engaging colors and exclusive patterns. Small enough to take on the go, these adorable playmats will transform any room into the perfect play space. Great for vacations, playdates, beach outings, and everyday use. 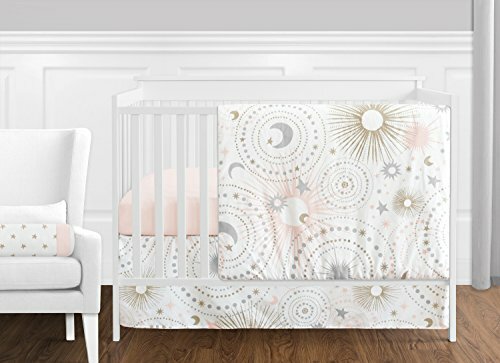 Celestial Baby 4 piece Crib Bumper - This is a traditional padded crib bumper that comes in 4 sections for a perfect fit. Fits most standard and convertible cribs, easy to attach, instructions included. Encourage eye tracking and sound perception skills with the Celestial Musical Mobile by Trend Lab. 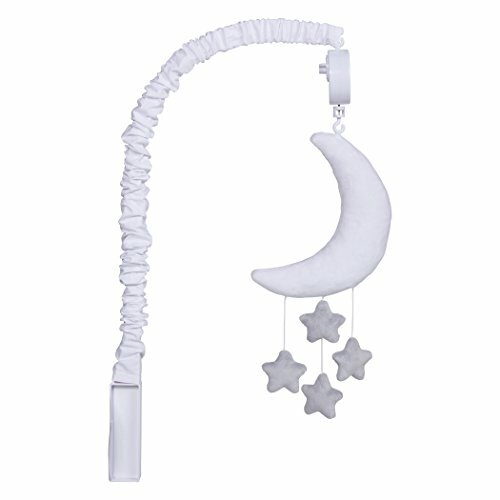 Mobile features a plush white moon with four plush stars and slowly rotates to Brahms' Lullaby. Mobile easily attaches to most cribs. Mobile measures approximately 24 inches tall by 17 inches wide. Create the best sleep space possible for your child with this 4-Piece Reversible Toddler Bedding Set in Dusty Skies from Delta Children. 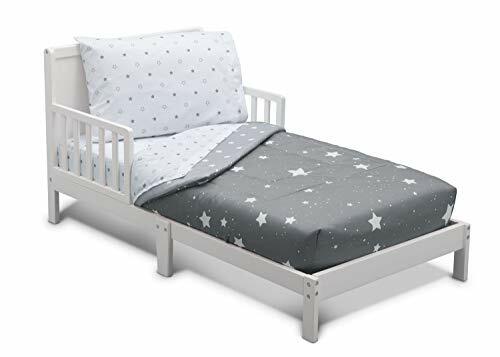 4-Piece Set: This boys' toddler bedding set includes a fitted sheet, flat top sheet, standard size pillowcase, and a reversible comforter printed with a charming, celestial design of white stars against a grey background. 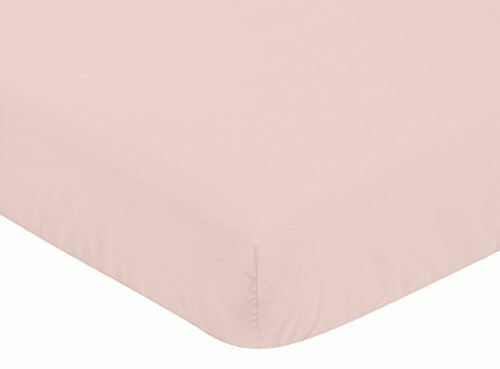 Elastic Bottom Flat Sheet and Comforter: Constructed from a soft poly/cotton blend, these sheets will provide an oh-so-cozy "big kid bed" for your growing toddler. The set's innovative top flat sheet and comforter have elastic bottoms to keep them in place, so it's easy to keep your little one's bedroom looking its best. Perfect Size: Designed to fit a standard toddler size bed, with a 27" x 52" mattress. The Peanut Shell Cloud Print 4 Piece Crib Bedding Set in Grey on White features a beautiful 100% cotton sateen cloud print combined with a contemporary arrow stripe. The four piece crib set includes a Quilt, Fitted Sheet, Dust Ruffle, and a Digital Musical Mobile featuring elephants, clouds, and stars. Coordinating drapes, valances, crib rail guards, blankets, and alternative sheets are available from The Peanut Shell to create your perfect nursery. Minnie Mouse Loves Dots in Pink, White, and Black. This set includes a reversible comforter, fitted crib sheet, dust ruffle, and coordinating keepsake box. Patchwork squares feature Minnie's iconic black silhouette on bright pink; a popping pattern of polka dots in pink, fuchsia, and black on white; pink and white stripes; Minnie peeking from a pink polka dot background; and a pink border with heart outlines in black and white on one side and a coordinating, pink, polka dot pattern on the other. Features: Color: -White/Gray. Material: -Polyester. Number of Items Included: -4. Pieces Included: -1 Quilt, 1 sheet, 1 dust ruffle and 1 plush. Generic Specifications: -Machine wash cold, gentle cycle. Dimensions: Overall Height - Top to Bottom: -42". 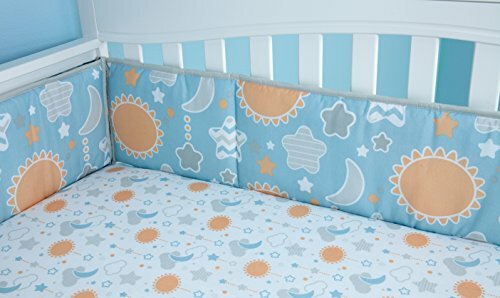 Little Bedding by NoJo Celestial Baby window valance coordinates with the Celestial Baby 10-Piece Crib Bedding Set (sold separately). The valance is perfect if you need additional valances for a second window or extra large window. The Bedtime Originals Snoopy Sports 3-Piece Crib Bedding Set includes a comforter, crib skirt and fitted sheet. The comforter showcases a large appliqued Snoopy and baseball mitt. The crib skirt features sports themes on all four sides. The 3-piece bedding set includes one quilt, one fitted crib sheet, and one dust ruffle. An appliqued furry little fox enjoys the great outdoors underneath a gray tree with his favorite woodland friends. The fitted crib sheet features friendly foxes, cute raccoons, wise owls and trees. The dust ruffle is a trendy triangle print which is also the back of the quilt. Fabrications are a cotton poly blend exclusive of ornamentation. Imported. The Bedtime Originals Friendly Forest 3-Piece Crib Bedding Set includes a quilt, fitted sheet and crib skirt. It's sure to make a charming addition to your nursery decor. The Heavenly Soft Minky Dot three-piece portable/mini-crib set fits all standard porta-crib mattresses. It includes a heavenly soft reversible comforter, 100 percent cotton jersey sheet and a heavenly soft bed skirt. This set is made of an ultra-soft and elegant chenille material designed with plush minky dots. The set is a must for your nursery. Machine wash with like colors, mild detergent and gentle cycle. This Geenny Boutique 13-Piece Crib Bedding Set comes will everything you will need to set up a beautiful, functional nursery for your new little one. It is made to fit all standard cribs and toddler beds. This set includes a quilt, two valances, bedskirt, crib sheet, bumper, diaper stacker, toy bag, two pillows and three wall hangings. Give your baby’s nursery a stylish sense of cohesion with the Little Bedding 3-Piece Crib Bedding Set by NOJO. The set includes a comforter, fitted crib sheet, and dust ruffle that will instantly transform your child’s bedroom. The pieces combine pink, white, and gray with cute elephant embellishments for a neat and visually interesting design. Plus, keep the set clean without the fuss, using your own washing and drying machine. This sweet set also makes a great baby shower gift! Decorate your little one’s sleep space with this charming baby bedding three-piece crib set. Included is one quilt, one fitted crib sheet and one crib skirt. The quilt features Pearl, a beautiful white unicorn with appliqued mane and tail. She is surrounded by a clever little fox, a mommy and baby owl, a mischievous squirrel and a pretty colorful rainbow. 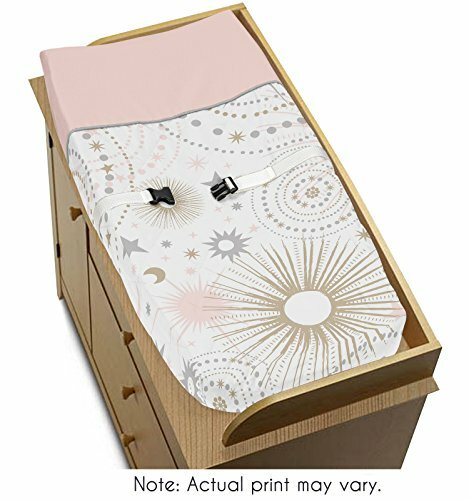 The fitted crib sheet features a rainbow of stars and is fully elasticized all around ensuring a secure fit. Complete this magical bedding set with the star-studded crib skirt with a soft pink ground. Made of a soft cotton poly blend. Imported. The Little Bedding by NoJo Ocean Dreams 3-Piece Crib Bedding Set features playful under the sea critters in a gender-neutral palette of turquoise, green and white. The Little Bedding by NoJo Ocean Dreams 3-Piece Crib Bedding Set includes an appliqued comforter, printed dust ruffle and bubble dot print fitted crib sheet! Decorate your little ones sleep space with this charming baby bedding crib set which includes one quilt, one fitted crib sheet, and one dust ruffle. The quilt features a friendly elephant, appliqued lion, adorable monkey with striped arms and legs and a colorful tree. A gray and white diamond print borders the quilt and is the background for the parade of animals on the dust ruffle. The fitted crib sheet is a tossed print of these adorable safari animals. Cotton Poly Blend. Imported. The six-piece Heavenly Soft Minky Dot Crib Bedding Set fits all standard 28-inch by 52-inch crib and toddler beds. The set is made of an ultra-soft and elegant chenille material designed with plush minky dots. Set includes: heavenly soft crib skirt, heavenly soft reversible comforter, 100 percent cotton jersey knit fitted crib sheet, two heavenly soft side rail covers and one heavenly soft long rail cover. This set is so soft it is a must have for the baby's nursery. Machine wash with like colors, mild detergent and gentle cycle.